East Holland as viewed to the northeast. Mural on San Juan Rd. East Holland is a neighborhood in northern Algonquin, Liberty City. It is bordered to the north by Wardite Street (Northwood), to the west by Exeter Avenue (North Holland), to the south by Topaz Street (Middle Park and Lancaster), and to the east by the Humboldt River. East Holland is a working-class neighborhood, lending itself to an interesting contrast in this part of Algonquin as the much more affluent and upscale Lancaster neighborhood lies to the south. Given that the neighborhood is located quite a distance away from the heart of Algonquin, this part of the borough has a much more gritty, urban character than the areas to the south. Unlike North Holland to the west, East Holland is primarily a residential area, with small tenements and townhouses serving as the main housing stock. There are very few high-rise buildings in the area and only one housing project (northern Algonquin is usually densely populated with housing projects). Members of the M.O.B. gang are often seen in East Holland. The eastern half of East Holland is more heavily based on Spanish Harlem, an African-American and Latino communities in Manhattan, while the western fringe is closer to being based on neighboring Harlem. 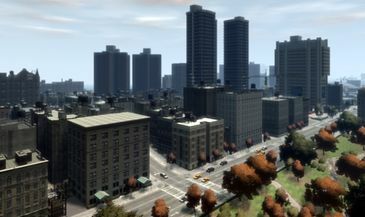 Prominent landmarks replicated in the district include the Adam Clayton Powell Jr. State Office Building, the National Black Theater building (known as the "Black National Institute Theater of Acting" in game), the 28 Precinct police station of the NYPD (as part of the East Holland police station) and The Taino Towers (known as "65 Uranium St." in game). The architecture of Exeter Avenue along the western fringe of the district also appears to derive from a specific area around Harlem's Apollo Theater at 125th Street; this includes the lesser known Victoria Theater (depicted in game as the "Movie Pit"), which in reality is only a few doors down the road from Apollo Theater, as well as Hotel Theresa (known as "Hotel Hamilton" in game), which is straddled at the western border between East Holland and North Holland, the former Blumstein's Department Store (as a corner building labeled with "Lovestein" signage), the modern Harlem Magic Johnson Theater (AMC Magic Johnson Harlem 9), and 258 West 125th Street (Harlem U.S.A). The LCPD has a major precinct in East Holland, which is possibly a NOOSE/LCPD joint station where an Annihilator spawns on the helipad. It is located at the intersection of San Juan Road and Topaz Street. The Liberty City Subway system serves the neighborhood. The Vespucci Circus station, on the Algonquin Outer Line, is located at Vespucci Circus on Wardite Street, along the neighborhood's border with Northwood. A second station, North Park, is located at the intersection of Denver Avenue and Topaz Street (along the East Holland-Middle Park border) and is served at all times by the Algonquin Inner Line.